Your veins make up an important part of your circulatory system which, along with your arteries and capillaries, works to circulate blood around your body, delivering vital oxygen as well as nutrients to your organs and tissues. In total, the combined length of all your blood vessels is approximately 100,000 miles, which is an enormous network to keep healthy. While your arteries pump oxygenated blood around your body, the job of most of your veins is to return the deoxygenated blood back to your heart. There are several different types of veins. These include deep veins, which lie within your muscles and return blood back to your heart; superficial veins, which can be found closer to the surface of the skin; and perforator veins, which connect the two, draining blood from the superficial veins back to the deep veins. Because veins are not subject to the same high pressure as arteries, they are less muscular and contain valves. In healthy veins, these tiny valves open and close, helping to prevent back flow and assisting the efficient flow of blood back to the heart. While veins remain healthy, your blood can continue to circulate as normal. However, veins can become unhealthy, with risk factors ranging from genetics and gender (women are more likely to develop varicose veins than men), to smoking, poor diet, inactive lifestyle and pregnancy. Poor vein health occurs when the valves become weakened, damaged or diseased, and eventually fail. This causes blood to flow backwards through the vein causing pooling, known as venous reflux. 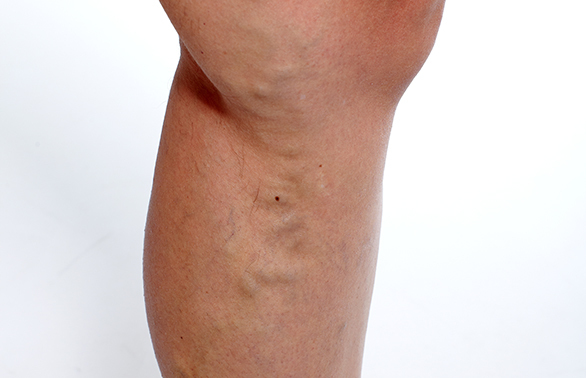 Over time, this pooling can result in the dilation, elongation, thickening, tangling and bulging of the veins, leading to visible conditions, including varicose veins. Pain associated with venous reflux can include swelling, aching, fatigue and heaviness, skin discolouration, throbbing, cramping, itching and eventually ulcers. 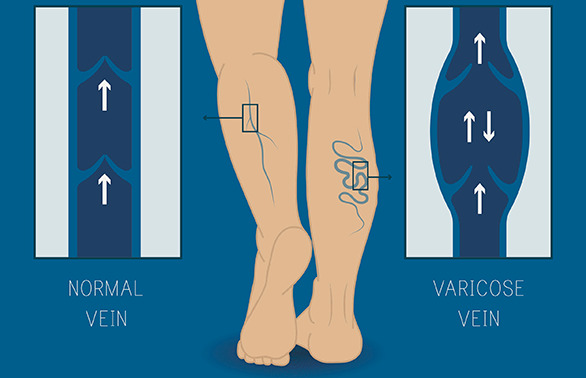 Read on to learn more about specific vein disorders, and find out how our team can help, should you desire treatment for a condition. Varicose veins often appear as enlarged, gnarled veins that twist and bulge in a rope-like pattern. They can range in colour from dark purple and blue, to red and flesh-coloured, and are often accompanied by uncomfortable sensations, including swelling, aching, heaviness, burning, throbbing, cramping and itching. They are most commonly found on the back of the calves, and the inner and front thighs, but they can occur anywhere within the leg, both above and below the knee, as well as in the feet. While varicose veins are rarely a serious condition, at the Harley Street Vein Clinic our staff understand the discomfort and embarrassment they can cause, and we are able to offer you a range of discreet and minimally invasive treatment options to restore the appearance of your legs. 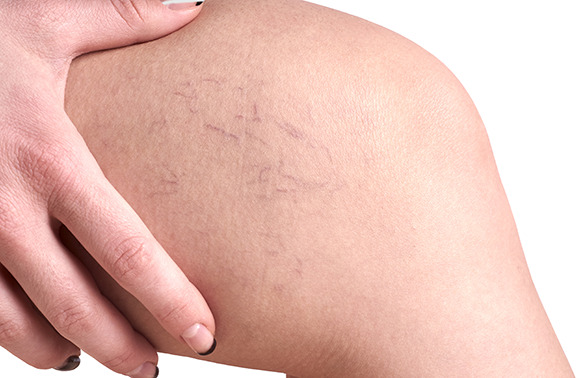 One of the most common venous conditions is spider veins. It appears as thin ‘webs’ of dark blue, purple or red-coloured veins that lie just below the skin’s surface. While they are often confused with varicose veins, spider veins differ in that they are typically not enlarged or swollen. Although spider veins are not serious, treatment is rarely needed for medical reasons, our team appreciate that they can cause discomfort (including aching and heaviness) and embarrassment for many. We therefore offer a quick and virtually painless non-surgical treatment option to reduce their appearance and restore your confidence. When superficial veins become damaged, the pooling of blood and increased pressure within the blood vessels can increase the fragility of your skin. The skin may initially appear red or brown in colour, but can eventually become a painful open wound or sore. Venous ulcers can be uncomfortable to the point of debilitating, and medical treatment is often required to promote healing and recovery. Rest assured, our consultants can offer the latest treatment to fully restore your quality of life. Similar to a varicose vein you might see in your leg, varicoceles are abnormally enlarged veins that occur within the scrotum. Caused when faulty valves prevent normal blood flow in veins within the spermatic cord, it can result in reduced fertility, swelling and discomfort, which can range from a sharp pain to a dull ache. Over time, the enlarged veins can increase in size and become more visible through the skin. At the Harley Street Vein Clinic, we appreciate this can cause a degree of embarrassment for patients, but our consultants can offer treatment options to restore your appearance and confidence.